So I broke a rule. A couple of them. Rule #1: I’ve skipped a category. Two even! Rule #2: I totally spent this weekend tidying by room. 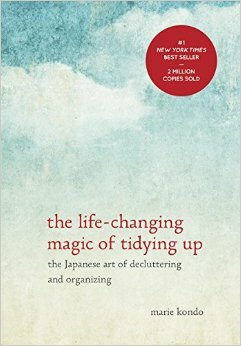 In “The Life-Changing Magic of Tidying Up: The Japanese Art of Decluttering and Organizing”, Marie Kondo creates a very specific way in which one should tidy their home. Mostly, I agree with her. Last week was clothes and I feel like I did a great job in tidying. Just as a reminder, I dumped 43% of my wardrobe in one day using her methods. And I have more than enough left over to keep me clothed for all occasions and extremely happy. Next up, according to the KonMari method, is books. If you didn’t know, I’m a writer. I am also a HUGE book lover. I collect books, I love books, and I rarely get rid of books. I have every intention of having a personal library to leave to children and grandchildren one day. Marie discusses how to only keep a shelf or two of the books you love most. For those with small spaces, those who don’t read frequently, or those who do read but have no real interest in the book once read… this is a brilliant idea. She has some very good comments and methods on this subject. For me… this will never work. Last year I went through my books and got rid of maybe 100 of them in a garage sale. This year I have already set aside a few more and I will do one final comb-through before our garage sale for the summer, but I don’t anticipate finding more than maybe… 20 or 30 to discard. I keep my books. Yes there are hundreds I have not yet read. The thing is I still truly want to read them. (And now that money is a bit tight and I can’t buy books right and left, I find myself going through my shelves and tackling those books I haven’t read yet anyway.) And for the hundreds I have not read, there are a thousand, maybe two, maybe more that I have. There is no sense in me handling every book I own until I am ready to finally truly organize and record every title and edition I own. This will take weeks at best, most likely months. No time now. Doing this will create the number one thing the KonMari method tells us to avoid: DISTRACTION. 1) Stop tidying room to room. It’s endless. Tidy by category. 2) If it doesn’t spark joy, throw it out. — I would add in that those things which are absolutely necessary and frequently used that do not spark joy are allowable, because I feel confident that is what Marie meant anyway. My toothbrush does not particularly spark joy, but it does give me nice clean teeth, which… kind of… does… so I suppose at least the result sparks joy? Now that I think about it, all of my ‘necessaries’ that don’t spark joy DO something that DOES. So. Well. Darn. Spark joy. Period. In “The Life-Changing Magic of Tidying Up”, Marie Kondo talks a lot about joy (and all the ways we clean in which joy is never even considered). This completely changed the way I looked at tidying my house. I will talk about this more throughout these posts. The KonMari method also gives specific categories to tidy, and the order in which to do them. There are a few times I haven’t (and probably won’t, seeing as how I’m still in the middle of this project) follow this… but I will give my personal reasons for doing so when we hit those points. The most difficult thing about writing for me is time. It isn’t so much about finding time at this stage in life (no kiddos around the house yet), it’s about allowing myself time. You see, I have this horrid little voice in my brain that tells me every day I should absolutely, positively NOT take any time for my hobbies and creative pursuits when there is work to be done. This is a problem. There is always work to be done. I am not a terribly messy person when it comes to the type of “Ew, gross, I don’t want to be barefoot or eat in your house” type of messes, but I am a very cluttered person. I have held onto things for memory’s sake, for “maybe I’ll someday use this” sake, for “but it was a gift” sake, for “it’s a waste to throw that out” sake… and because of that my house – which has ample enough room for two people by far – feels like a disaster to me. Disclaimer: I’m nowhere near hoarding levels, but it’s driving ME crazy, and isn’t that bad enough? I admit our third bedroom is the “I don’t know what to do with this” room. I want to have the room back, especially since next year we plan on several interior house fixer-upper projects. Difficult to do with mess around. My mind does not want to allow me anything that causes joy when things are not in their place. I have gotten better about this in stages, but the truth of the matter is it still hangs over my head like a Catholic school nun with a ruler.